Please refer to our stock # 9830 when inquiring. Charles McCall was born in Edinburgh. 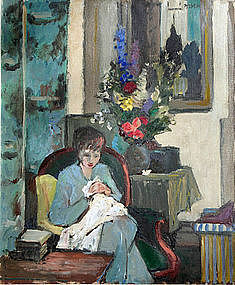 In 1933 he won a scholarship to the Edinburgh College of Art, where he studied under DM Sutherland and SJ Peploe. In 1938 he had the unusual distinction of being made a Fellow of Edinburgh College of Art at the age of 31. Continued studies in Paris at the Academie Colarossi under Friesz and elsewhere on the Continent between 1937-38. On his return he began immediately exhibiting work at the RA and with the London Group. Held one man shows in Manchester, Dublin in 1951, New York in 1955, Montreal and Winnipeg. Elected NEAC in 1957. His work is represented in the Paisley Art Gallery and City of Edinburgh Collection.